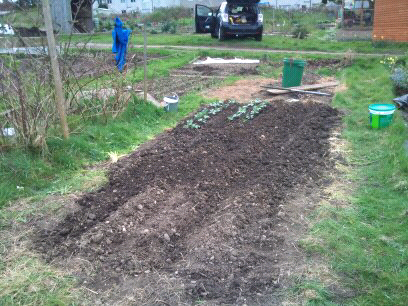 The early spuds went in on Saturday, along with some broad beans. The bed they went into was double dug and manured about a month ago, then covered in plastic while the spuds chitted. I was expecting it to be pretty dry, but the earth was very damp so I forked over the row before planting and didn't bother raking. Three kilos of Rocket earlies did two and a half rows spuds about a foot apart, just dropped into a troweled hole about six inches deep. 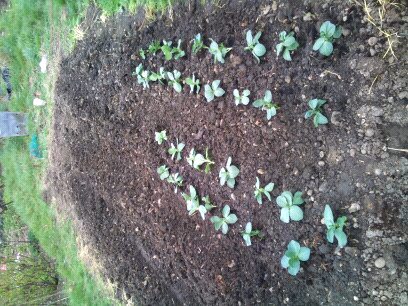 Broad beans carried on at the end of the half row. I don't know if beans should share a bed with potatoes but planting is driven by availability of space so this year it'll all go where there is space avaiable when seedlings are ready to come out of the greenhouse. There are another dozen or so plants almost ready. There were a few bits of couch grass growing from inch-long bits of root which I hadn't picked out while digging/forking. 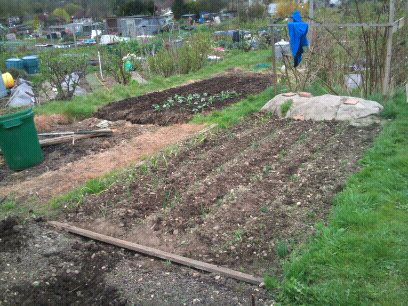 The allotment won't be seeing a rotovator until it's been hand dug to get the couch grass out! The weedkiller has effective, leaving a swathe of death which marks the next bed to be dug. I'll nip down one evening and windmill some more; once the weeds are red the newly weedkilled bit can go under plastic till it gets dug. Seeded the onion bed-need to hoe it next time. Dug some very deep rooted weeds out of the seedbed where my early sowings are not doing much. Plenty of seedlings in the greenhouse: Borlotti beans and sweetcorn will need beds digging next month.